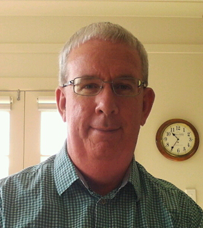 Mark Lunney re-joined UNE School of Law in July 2012. He trained as a solicitor in Brisbane before obtaining an LLM from the University of Cambridge. Between 1991-2003 he was lecturer, senior lecturer and reader at the School of Law, King's College London. He was an Associate Professor in the School of Law at UNE between 2003-2011 and from 2011-2012 he was Professor and Director of Research in the ANU College of Law. His research interests are the law of tort, and the history of the common law and legal profession, and he has published extensively on the law of torts in both Australia and the United Kingdom (see' e.g., Barker, Cane, Lunney & Trindade, The Law of Torts in Australia (5th edn, 2012) and Lunney & Oliphant, Tort Law: Text and Materials (5th edn, 2013). LLB (Hons), BA (Qld), LLM (Cantab), Solicitor of the Supreme Courts of Queensland and England & Wales. Mark Lunney & Ken Oliphant, Tort Law: Text & Materials (Oxford: OUP, 2000) ISBN 0-19-876401-4. Mark Lunney & Ken Oliphant, Tort Law: Text & Materials (Oxford: OUP, 2nd ed., 2003) ISBN 0-19-926055-9. Francis Trindade, Peter Cane and Mark Lunney, The Law of Torts in Australia (Melbourne, OUP, 4th ed, 2007) ISBN 0-19-551620-6. Mark Lunney & Ken Oliphant, Tort Law: Text & Materials (Oxford: OUP, 3rd ed, 2008) ISBN 978-0-19-921136-4. Mark Lunney & Ken Oliphant, Tort Law: Text and Materials (Oxford, OUP, 4th ed, 2010) ISBN 978-0-19-957180-2. Kit Barker, Peter Cane, Mark Lunney and Francis Trindade, The Law of Torts in Australia (Melbourne, OUP, 5th edn, 2012). Mark Lunney & Ken Oliphant, Tort Law: Text and Materials (Oxford, OUP, 5th ed, 2013) ISBN 978-0-19-965538-0). Mark Lunney, Helmut Koziol, Mike Green, Ken Oliphant, Yang Lixin (eds), Product Liability: Fundamental Questions of Product Liability in a Comparative Perspective (De Gruyter, 2017). Mark Lunney (80%) & Robert Burrell, "A farmer's choice? Legal liability of farmers growing crops" (Department of Agriculture, Forestry and Fisheries, 2006) ISBN 0-9757221-6-6. Mark Lunney, "Capacity to Commit a Tort and to Sue", pp 31-64, The Law of Tort, A Grubb (ed), (Butterworths, 2002) ISBN 0-406-89672-0. Mark Lunney, "Trespass to Land", pp 397-432, The Law of Tort, A Grubb (ed), (Butterworths, 2002) ISBN 0-406-89672-0. Mark Lunney, "Wrongful Interference with Goods", pp 433-502, The Law of Tort, A Grubb (ed), (Butterworths, 2002) ISBN 0-406-89672-0. Mark Lunney & Paul Mitchell, "Intentional Interference with the Person", pp 349-396, The Law of Tort, A Grubb (ed), (Butterworths, 2002) ISBN 0-406-89672-0. Mark Lunney, "Capacity to Commit a Tort and to Sue", pp 39-85, The Law of Tort, K Oliphant (ed), (Butterworths, 2nd ed, 2007) ISBN 978 1 4057 1240 8. Mark Lunney, "Trespass to Land", The Law of Tort, pp 485-534, K Oliphant (ed), (Butterworths, 2nd ed, 2007) ISBN 978 1 4057 1240 8. Mark Lunney, "Wrongful Interference with Goods", pp. 535-627, The Law of Tort, K Oliphant (ed), (Butterworths, 2nd ed, 2007) ISBN 978 1 4057 1240 8. Mark Lunney & Paul Mitchell, "Intentional Interference with the Person", pp 437-484, The Law of Tort, K Oliphant (ed), (Butterworths, 2nd ed, 2007) ISBN 978 1 4057 1240 8. Mark Lunney, "Goldman v Hargrave", pp. 199-227, in Charles Mitchell and Paul Mitchell (eds), Landmark Cases in the Law of Tort (Oxford: Hart Publishing, 2010). Mark Lunney, "Australia", pp. 592-623, in B.A. Koch (ed), Damage Caused by Genetically Modified Organisms: Comparative Survey of Redress Options for Harm to Persons, Properly or the Environment (De Gruyter, 2010). Mark Lunney, "Personal Injury Damages for Non-Pecuniary Loss in Australia: A Recipe with Too Many Ingredients? ", pp. 126-147, in Proceedings of the 4th International Conference on 'Law in the Changing World' (Faculty of Law, Thammasat University, Bangkok, Thailand, 2011). Mark Lunney, "Employers' Liability and Workers' Compensation: Australia", pp. 1-61, in K. Oliphant & G. Wagner (eds), Employers' Liability and Workers' Compensation (De Gruyter, 2012). Mark Lunney, "Trespass to Land", The Law of Tort, pp 467-517, K Oliphant (ed), (Butterworths, 3rd ed, 2015) ISBN 978 1 4057 6344 8. Mark Lunney, "Intentional Interference with the Person", pp 417-466, The Law of Tort, K Oliphant (ed), (Butterworths, 3rd ed, 2015) ISBN 978 1 4057 6344 8. Mark Lunney, ‘Australia: a land of plenty (of legislative regimes)’, pp 367-415, Comparing Tort and Crime: Learning from across and within Legal Systems, M Dyson (ed),(Cambridge University Press, 2015), ISBN 978-1-107-08048-5 (with Arlie Loughnan, Kylie Burns and Sonya Willis). Mark Lunney, Ronan Perry, Anton Fagan and Enrique Barros, “Rest of the World”, in M Lunney, H Koziol, M Green, K Oliphant, Y Lixin (eds), Product Liability: Fundamental Questions of Product Liability in a Comparative Perspective (De Gruyter, 2017) pp 411-497. Mark Lunney, "Negligence and the Recovery of Pure Economic Loss - the Re-Opening of Pandora's Box? ", Queensland Law Society Journal, 19, 1989, pp 59-70. Mark Lunney, "Towards a Unified Estoppel - The Long and Winding Road", The Conveyancer, 1992, pp 239-251. Mark Lunney, "A Common Law of Illegality in Equity", Trust Law International, 6, 1992, pp 110-112. Mark Lunney, "Hillsborough - The One that Got Away", King's College Law Journal, 3, 1992, pp 170-172. Mark Lunney, "Never Trust a Man....", Modern Law Review, 56, 1993, pp 87-91. Mark Lunney, "More about a common law of Illegality in Equity", Trust Law International, 7, 1993, pp 114-116. Mark Lunney, "Trespass and Case - A New Lease of Life? ", King's College Law Journal, 4, 1993, pp 79-81. Mark Lunney, "Jorden v Money - A Time for Reappraisal? ", Australian Law Journal, 68, 1994, pp 559-575. Mark Lunney, "Once (or twice) more to the Breach, Dear Friends? ", King's College Law Journal, 5, 1994, pp 121-124. Mark Lunney, "Rewriting Rylands v Fletcher and non delegable duties in Australia", King's College Law Journal, 5, 1994, pp 133-136. Mark Lunney, "What Price a Chance? ", Legal Studies, 15, 1995, pp 1-13. Mark Lunney, "Insurance and the Liability of the Legal Profession - A Case Study", Journal of Legal History, 16, 1995, pp 94-106. Mark Lunney and Paul Matthews, "A Tortfeasor's Lot is not a Happy One? ", Modern Law Review, 58, 1995, pp 395-403. Mark Lunney, "Common Sense and Market Losses", King's College Law Journal, 6, 1995, pp 99-101. Mark Lunney, "The Solicitor and the Bookmaker - the Foundation of the Solicitors' Compensation Fund", Queensland Law Society Journal, 26, 1996, pp 35-50. Mark Lunney, "The Law Society and the Defalcation Scandals of 1900", Journal of Legal History, 17, 1996, pp 244-269. Mark Lunney, "Chances of Recovery in Tort", King's College Law Journal, 7, 1996, pp 101-104. Mark Lunney, "Letter from America: Tort Reform Illinois Style", King's College Law Journal, 8, 1997, pp 43-68. Mark Lunney, "A good idea gone bad, or just a bad idea? - the establishment of the Solicitors' Fidelity Guarantee Fund", Victoria University of Wellington Law Review, 27, 1997, pp 317-347. Mark Lunney, " 'And the Lord Knows where that might lead' - the Law Society, the fraudulent solicitor and the Solicitors Act 1941", International Journal of the Legal Profession, 4, 1997, pp 235-266. Mark Lunney, "Tortfeasor Defendants and Gratuitous Care", King's College Law Journal, 8, 1997, pp 115-117. Mark Lunney, "A Golfer is Not a Gentleman? ", Sport and the Law Journal, 6, 1998, Issue 2, pp 4-18. Mark Lunney, "In Support of the Chancellor's Foot", King's College Law Journal, 9, 1998, pp 116-122. Mark Lunney, "Don't Play with Matches", Law Quarterly Review, 114, 1998, pp 377-379. Mark Lunney, "Look before You Leap", Cambridge Law Journal, 57, 1998, pp 441- 444. Mark Lunney, "A Tort Lawyer's View of Osman v United Kingdom", King's College Law Journal, 10, 1999, pp 238-247. Mark Lunney, "Osman in Action – Article 6 and the Commission Reports in Z v United Kingdom and TP & KM v United Kingdom", King's College Law Journal, 11, 2000, pp 119-126. Mark Lunney, "Never Say Never Again", King's College Law Journal, 12, 2001, pp 244-251. Mark Lunney, "Practical Joking and its Penalty: Wilkinson v Downton in Context", Tort Law Review, 10, 2002, pp 168-187. Mark Lunney, "The Price of Responsible Parenting", King's College Law Journal, 13, 2002, pp. 219-221. Mark Lunney, "Six and Out? : Bolton v Stone after 50 years", Journal of Legal History, 24, 2003, pp. 1-22. Mark Lunney, "Occupiers and Obvious Risks", Tort Law Review, 11, 2003, pp. 140-145. Mark Lunney, "Damage and Cross-Pollination by a Deliberately Released Genetically Modified Organism? ", University of New England Centre for Agriculture and Law, Ag Law Papers Series 1, 2004. Mark Lunney, "A Right Old Mess", University of New England Law Journal, 1, 2004, pp. 145-155. Mark Lunney, "Cole v South Tweed Heads Rugby League Club Limited", University of New England Law Journal, 1, 2004, pp. 239-247 (with Julia Werren). Mark Lunney, "Personal Responsibility and the New Volenti", Tort Law Review, 13, 2005, pp. 76-91. Mark Lunney, "Causation, Science, and Sir Owen Dixon", Australian Journal of Legal History, 9, 2005, pp. 205-226. Mark Lunney, "Stress at Work: To Tell or Not to Tell? ", University of New England Law Journal, 2, 2005, pp. 75-77. Mark Lunney, "Simplicty is a Virtue? – Negligent Misstatement and Physical Injury in the House of Lords", Tort Law Review, 14, 2006, 129-132. Mark Lunney, "Principles-Based Reform of the Law of Tort: Not as Easy As It Sounds? ", University of New England Law Journal, 3, 2006, pp. 211-219. Mark Lunney, "False Imprisonment, Fare Dodging and Federation – Mr Robertson's Evening Out", Sydney Law Review, 31, 2009, 537. Mark Lunney, "Counterfactuals and Corrective Justice: Legal History and Allan Beever's Rediscovering the Law of Negligence", Torts Law Journal, 17, 2009, 219. Mark Lunney, "Federation and beyond: What the history of Australian tort law can tell us", Australian Bar Review, 33, 2010, 77. Mark Lunney, "Legal Émigrés and the development of Australian tort law", Melbourne University Law Review, 36, 2012, 494. Mark Lunney, "Fleming's Law of Tort: Australian made or foreign import? ", Australian Bar Review, 36, 2013, 211. Mark Lunney, “Common Practice, Breach of Duty and Jury Trials: The History of Mercer v Commissioner for Road Transport and Tramways (1936)” (2017) 44 Australian Bar Review 44-159. Mark Lunney, Contributing Editor, The Oxford Companion to Twentieth-Century British Politics, (Oxford: Oxford University Press, 2002) (6 entries). Mark Lunney, Contributing Editor, The New Dictionary of National Biography, (Oxford: Oxford University Press, 2004) (3 entries). Mark Lunney, Contributing Editor, Oxford Companion to Law (Oxford: Oxford University Press, 2008) (3 entries). "The Law Commission's Consultation Paper – Damages for Psychiatric Injury"
Paper delivered to Royal Society of Medicine's Psychiatric Section Conference, London, May 1996. Panel Member, "The Future of Legal History – A Round-Table Discussion", Second Theory in Legal Education Colloquium, Institute of Advanced Legal Studies, January 1998. Panel Member, "The Decisions of the ECHR in Z v UK; TP & KM v UK", British Institute of International and Comparative Law, June 2001. "Tort Issues in the Planting of GM Crops', Seminar Paper presented at the seminar series of the Australian Centre for Intellectual Property and Agriculture, Australian National University, August 2004. "Tony Martin Rules OK! – Tort Reform in New South Wales", public lecture delivered at University of East Anglia, Norwich, February 2005, as part of the Norwich Law School's Public Lecture Series for 2005. Panel Member, Victorian Farmers' Federation Seminars, GM Information, Dookie Campus, Swan Hill, Murtoa, February 19-21, 2008. "Counterfactuals and Corrective Justice: Allan Beever's Rediscovering the Law of the Negligence and Bolton v Stone in Context", Staff Seminar, TC Beirne School of Law, University of Queensland, September 19, 2008. "The place of legal history", Invited Speaker, Torts Academic Workshop, University of Sydney Law School, 20 March, 2009. "Bushfires and the Common Law: Fanning the Flames of Negligence", Invited presenter, Symposium on Landmark Cases in the Law of Tort, School of Law, King's College London, 24 April, 2009. "Federation and Beyond: What the History of Tort Law Can Tell Us', Invited speaker, the Forbes Lecture for 2009, Francis Forbes Society for Australian Legal History, November 2009. "Damages for Non-pecuniary loss – the Australian Context", 4th International Conference on 'Law in the Changing World' at the Faculty of Law, Thammasat University, Bangkok, 9 December 2009. "Australian Tort Law: Unity, Fragmentation and Complexity", paper presented to the Second International Forum on Civil Law, Fudan University Law School, Shanghai, China, August 16-17, 2011. "Sources and Sauces: The Intellectual and Contextual Dimensions of the History of Private Law", paper delivered at the Law, History, Culture: Reading Sources symposium, University of Technology, Sydney, July 26, 2013. "Country Report: Australia and Chile", paper presented at the inaugural academic conference of the World Tort Law Society, Renmin University and Heilongjiang University, China, September 14-17, 2013. ‘Australian Tort Law as the Empire’s Law’, paper presented to the Francis Forbes Society for Australian Legal History, NSW Bar Association, October 22, 2014. “A Very Australian Story: Political Libels and the Conscription Referendums of the First World War’, Rare Books Lecture, Melbourne Law School, July 21, 2016. “John Fleming”, paper presented at Lives Lived with Legal Institution Symposium, Melbourne Law School, November 3 2016. “A Different Kind of Activism: Isaacs Isaacs in Tort Law”, Staff Seminar, University of Tasmania School of Law, June 22, 2017. "Autonomy and Medical Law", paper presented (with Natasha Cica) to residents of London Goodenough Trust, 1992. "Disasters and the Law of Negligence", paper presented to residents of London Goodenough Trust, 1993. "The Right to Silence", paper presented to the residents of London Goodenough Trust, 1994. "A Victorian Scandal – this time at the Law Society", lecture delivered to Middle Temple Historical Society, Middle Temple Hall, February 1996. "The passing of the Solicitors Act 1941", paper presented to the London Legal History Seminar Series, May 1997. "Bolton and Stone after 50 years", paper presented to the London Legal History Seminar Series, May 2001. "Human Rights and Private Law: An Unhappy Combination? ", University of New England School of Law Kirby Seminar, September 2003. "Itchy Underpants and Judicial Skepticism", Paper presented to the 23rd Annual Conference of the Australia and New Zealand Law ands History Society, St. George's College, University of Western Australia, July 2004. "Historical Methodology and the Common Law of Tort", University of New England Kirby Seminar, September 2004. "Practical Jokes, Cricket, and Itchy Underpants – the Use and Abuse of Law as Social History", Seminar presented to the School of Classics, History and Religion, University of New England, October 2004. "Causation, Science, and Sir Owen Dixon", paper presented to the London Legal History Seminar, January 2005. "Federation and Fare Dodging", paper presented at the 18th British Legal History Conference, St Catherine's College, Oxford, 2-5 July 2007. "Federation Follies: Press Reaction to Balmain New Ferry Company v Robertson", paper presented at 26th Annual Australia and New Zealand Law and History Society Conference, School of Law, University of New England, September 21-23 2007. "Counterfactuals and Corrective Justice: Allan Beever's Rediscovering the Law of the Negligence and Benjamin Cardozo as Champion", paper presented to the 27th Annual Australia and New Zealand Law and History Society Conference, University of Adelaide, December 11-13, 2008. "Contingency and the Common Law: Hargrave v Goldman at 1st Instance", paper presented to the 28th Annual Australia and New Zealand Law and History Society Conference, Victoria University of Wellington, December 11-13, 2009. "Legal Emigres and the Development of Australian Private Law", paper presented to the 30th Annual Australia and New Zealand Law and History Society Conference, University of Queensland and Griffith University, December 12-13, 2011. "The making of the king – John Fleming in Canberra", research in progress seminar presented to ANU College of Law, 7 June 2012. "Fleming's Law of Tort: Australian made or foreign import? ", public lecture delivered under the auspices of the NSW Bar Association and the Forbes Society for Australian Legal History in the NSW Bar Association Common Room, August 9, 2012. "Lavatories and Free Will: Causation conundrums in the High Court", paper presented to the 31st Annual Australia and New Zealand Law and History Society Conference, University of Technology, Sydney, December 10-12, 2012. "The Tangled Web we Weave: Consumer Protection and Complexity in the Australian Consumer Law", seminar presented to the Faculty of Law, University of Hong Kong, China, November 6, 2013. "England's Obedient Servant? 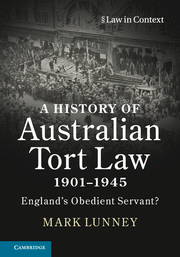 The hidden dynamism in the development of Australian tort law 1901-1945", paper presented to the 32nd annual conference of the Australia and New Zealand Law and History Society, November 25-27, 2013 University of Otago, Dunedin, New Zealand. “Historiography and the History of Australian Private Law in the first half of the 20th Century: Et in Arcadia ego?”, paper presented at the ‘Private Law at the End of Empire’ Symposium, School of Law, University of New England, December 9, 2014. “Of Errant Shots and Ships: the Australian Approach to negligence in defence of the realm’, seminar presented to the College of Law, Australian National University, 21 April 2016. ‘England’s Obedient Servant? Historiography and the history of Australian law in the first half of the 20th century’, seminar presented at School of Law, King’s College London, 22 November 2016. “Nervous Shock and the Chameleon Nature of English Judicial Decisions in Australian Legislation: Section 4 of the ‘Law Reform (Miscellaneous Provisions) Act 1944’ (NSW)’, paper presented to the London Legal History Seminar Series, Institute of Advanced Legal Studies, 2 December 2016. ‘Independent Australian Britons and the development of Australian Law’, paper presented at British Race Nationalism and Australian Law in the 20th Century Symposium, School of Law, University of New England, February 14-15, 2017. 1995 – King's College School of Law Research Committee - To consider the reasons for the introduction of the Solicitors' Fidelity Guarantee Fund in New Zealand and Queensland. 1996 – King's College London Research Strategy Fund - To consider legislative tort reform in the United States, with special reference to the state of Illinois. 2005 – Australian Centre for Intellectual Property in Agriculture – research report for the Department of Agriculture, Fisheries and Forestry (Australia) – To consider the liability of farmers growing crops. 2009 - Institute for European Tort Law – report for Australia on liability associated with planting GM crops. 2013 – Australian Research Council DP130103626, Chief Investigator – 'England's Obedient Servant? – The History of Australian Tort Law 1901-1945'. Book Review of Ball & Cooper, "Of Power and Right", Journal of Legal History, 14, 1993, pp 159-160. Book Review of Brand, "The Origins of the English Legal Profession", Cambridge Law Journal, 1993, pp 531-533. Book Revierw of Mullaney & Handford, "Tort Liability for Psychiatric Injury", Medical Law Review, 1, 1993, pp 408-412. Book Review of Horwitz, "The Transformation of American Law 1870-1960", Journal of Legal History, 15, 1994, pp 193-196. Book Review of Horwitz, "Chancery Equity Records and Proceedings", Tolley's Trust Law International, 10, 1996, pp 127-8. Book Review of Sugarman (ed), "Law in History", Journal of Legal History, 18, 1997, pp 56-61. Book Review of Newman (ed), "The New Palgrave Dictionary of Economics and the Law", Solicitors Journal, 142, 1998, pp 724-5. Book Review of Mullaney (ed), "Torts in the Nineties", King's College Law Journal, 9, 1998, pp 157-160. Book Review of Stretton, "Women Waging Law in Elizabethan England", King's College Law Journal, 10, 1999, pp 136-138. Book Review of Spence, "Protecting Reliance", Tolley's Trust Law International, 14, 2000, pp 62-64. Book Review of Smith, "Lawyers, Legislators and Theorists: Developments in English Criminal Jurisprudence 1800-1957", Journal of Legal History, 21, 2000, pp 139-141. Book Review of Kneebone, "Tort Liability of Public Authorities", Adelaide Law Review, 22, 2000, pp 109-115. Book Review of Ibbetson, "A Historical Introduction to the Law of Obligations", Tort Law Review, 10, 2002, pp 71-75. Book Review of Pedersen, "Marriage Disputes in Medieval England", Ecclesiastical Law Review, 6, 2002, pp 406-408. Book Review of Taggart, "Private Property and Abuse of Rights in Victorian England", King's College Law Journal, 15, 2004, pp 212-216. Book Review of Bennett, "Lives of the Australian Chief Justices" (Sir Francis Forbes (2001); Sir James Dowling (2001); Sir William a'Beckett (2001); Sir Charles Cooper (2002); Sir Archibald Burt (2002); Sir John Pedder (2003); Sir James Cockle (2003)), Journal of Legal History, 26, 2005, pp 220-224. Book Review of Bennett, "Lives of the Australian Chief Justices" (Sir Henry Wrenfordsley (2004), Sir William Stawell (2004)), Journal of Australian Colonial History, 8, 2006, pp. 216-219. Book Review of Mitchell, "The Making of the Modern Law of Defamation", King's College Law Journal, 17, 2006, pp. 165-169. Book Review of Bennett "Lives of the Australian Chief Justices" (Sir James Martin (2005)), Callaghan's Diary (2005), and Colonial Law Lords (2006)), Australian Bar Review, 28, 2006, pp. 110-116. Book Review of Hodgson, "The Law of Intervening Causation", King's Law Journal, 21, 2010 pp. 411-416. Book Review of Green & Randall, "The Tort of Conversion", Torts Law Journal, 18, 2010, pp. 287-291. Book Review, 'Torts in Commercial Law', Torts Law Journal, 20, 2012-13, pp. 145-151. Book Review of Mitchell (ed), 'The Impact of Institutions and Professions on Legal Development', Journal of European Tort Law, 5, 2014, pp. 125-129. Letter to the Editor, Australian Law Journal, 66, 1992, pp 756-7. "Legal Network Television" (1993), videotaped discussion of leading contemporary tort cases for distribution to solicitors. Letter to the Editor, Australian Law Journal, 70, 1996, pp 201. Evidence given to House of Commons Constitutional Affairs Committee (UK), Compensation Culture, Third Report of Session 2005-2006, Volume 2, Ev 194-197. I have also been a consultee to numerous Law Commission Consultation Papers (UK) and to the panel reviewing the operation of the Gene Technology Act 2000 (Cth).